On Wednesday, May 7th, Canada’s National Research Council (NRC) successfully mounted the DVA-1 Primary Dish onto the telescope pier. DVA-1 is a prototype antenna for the international Square Kilometre Array (SKA) project. 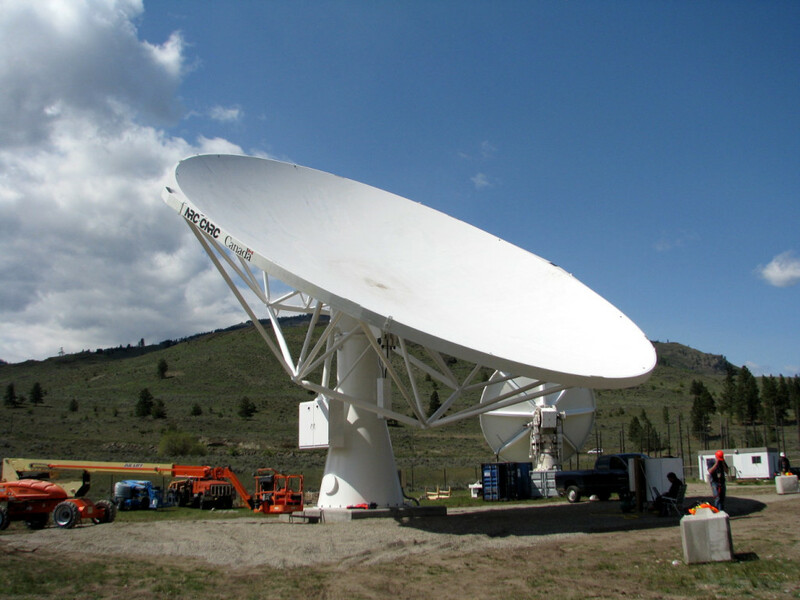 Built just outside of Penticton, BC, Canada, the giant radio dish (or reflector), measures 15m in diameter and weighs in at 8.7 tonnes and is the first of its kind to be made with a single piece of carbon fibre. In a remarkable testament to the robustness of the design, last October, the dish suffered a setback when a sudden gust of wind lifted the dish causing it to buckle under its weight during helicopter transport from Okanagan Falls, BC. However, within three days crews managed to restore the dish to its original shape while engineers succeeded in restoring its original reflective properties. The installation of the dish onto its pedestal is a major step forward for NRC’s SKA prototype antenna. Three prototype antennas are being built by the SKA’s Dish Consortium: DVA-1 in Canada, DVA-C in China, and MeerKAT-1 in South Africa. The SKA Dish Consortium is responsible for the design and verification of the final SKA dish antenna. The other prototypes have also been moving forward in the past few months. In March, the first MeerKAT antenna was inaugurated in South Africa. And back in January, the Chinese partners also made progress by successfully completing the subreflector part of their antenna. In June this year, the Dish Consortium will make a recommendation on the design of the SKA dish configuration. Over the next two years, the three different prototypes will be used to test various subcomponents of the dishes. These tests will be fed into the design of the final SKA prototype known as SKA-P, to be ready by the end of 2016. In its first phase of construction, the SKA will see 190 SKA antennas built in the Karoo alongside the 64 MeerKAT antennas and 60 antennas built in Australia alongside the 36 ASKAP antennas. When the SKA is complete, around 2000 dishes will spread across Africa. You can watch media coverage of the dish’s successful installation here.